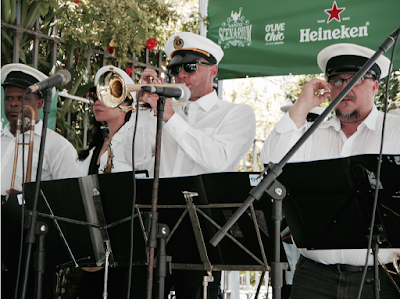 The Favela Brass Project: Thank you, Chris Caulfield! For the last two months, London-based (originally from Yorkshire) professional trumpet player Chris Caulfield has been giving lessons on a voluntary basis at the project. The language barrier didn't stop Chris from getting on great with the kids and his lessons were a huge help to us. 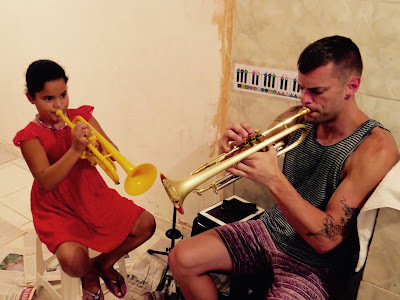 To get children off on the right foot with learning a musical instrument, individual attention is extremely important, so to have a world-class trumpet-player like Chris helping the kids take their first steps was a great luxury for us! As well as giving lessons at the project Chris also got involved in the music scene in Rio and played New Orleans Second Line music with the São Jorge Brass Band at Lavradio Jazz Festival, as part of Rio Carnival. Not only were Chris' musical talents put to good use during his stay at the project, but he also helped to paint the school and even did a spot of rewiring for us! I think it's fair to say that Chris enjoyed his time in Rio, and is at least thinking about coming back next year. If that happened it would be great news for us - but in any case we are very grateful indeed to Chris for donating his time and talents so generously to the project over the last couple of months. Thanks ever so much Chris and happy gigging back in London!